A Thought: The World. Savannah was a wonderful experience—perhaps in the top five U. S. Cities we have visited in our marriage. The people were very courteous, the parks and streets clear of clutter and debris, the food delicious, and many, many places to walk, whether strolling, or briskly. 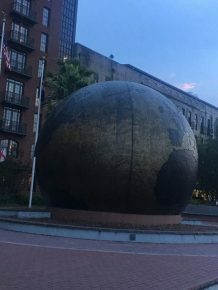 We passed by this world monument by the River Street park area. It reminds merchants and travelers alike, Savannah is a great commerce hub to the world.